Not sleeping well? The past few months have been pretty stressful here on Planet Earth, so maybe you something to help ease you into a restful, refreshing slumber each night. 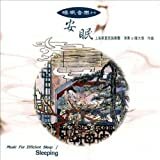 [The title] ‘Music for Efficient Sleep’ sounds unwieldy, but the soothing tones of the Shanghai Chinese Traditional Orchestra produce results! After listening to this music, I had the most intense dreams I’ve had in over a year…. [Music for Efficient Sleep] is a wonderful, mind-relaxing collection of music. Not just for sleep, but anytime you wish to create a personal tranquility zone. At work, when the hallway “clutter” noise is overwhelming, I close my office door, slide the CD in my PC, and soon I am harmoniously one with my tasks. I’m not sure I would ever want to find myself “harmoniously one with my tasks” at work (maybe with a martini after work…. ), but in any case, “Music for Efficient Sleep” will help make any setting - work, home, school or car - a more relaxing place to be. Heck, why not just go by “Sleeping: Music for Efficient Sleep” now. This inefficient sleep thing has simply gone on too long.